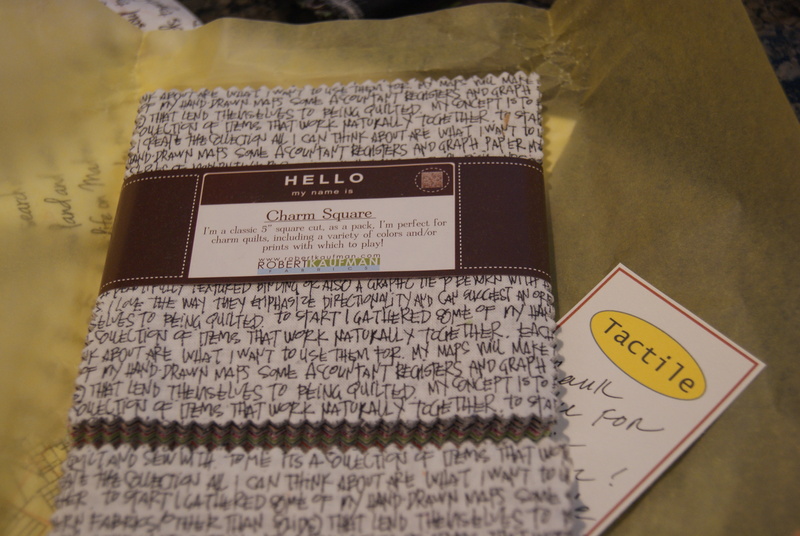 Last week I signed up for Rachel’s Penny Sampler class, for which we will make this quilt. So, yeah, pick your jaw up off the floor and help me already. We’ve spent both Christmases of Lucy’s life with her grandparents in Tennessee or Georgia. While last year we bought a tree and decorated it with a box of ornaments my mom had saved back for me (including an angel topper that my late granny crocheted), we haven’t done a great job at establishing family Christmas traditions with Lucy. Presents free-for-all, or one person at a time? Cinnamon rolls or breakfast casserole? Turkey or ham? Pecans or marshmallows on the sweet potatoes, people. This is important stuff. It’s not a big thing. But I think it would help our family to have a special quilt that only comes out in December, that we snuggle under to watch Home Alone and Charlie Brown. It might take a few years but eventually you’d know you were home when you saw the quilt. But. A traditional Christmas quilt isn’t quite my style. 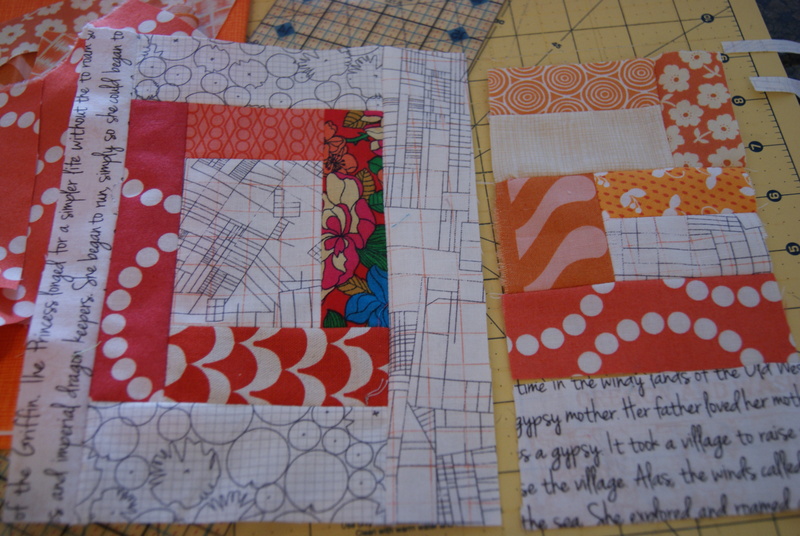 And, more and more, I’m not sure I like single-line quilts at all. The Aneela Christmas fabric is, for example, super cute–but I’m going to be bored sewing it. 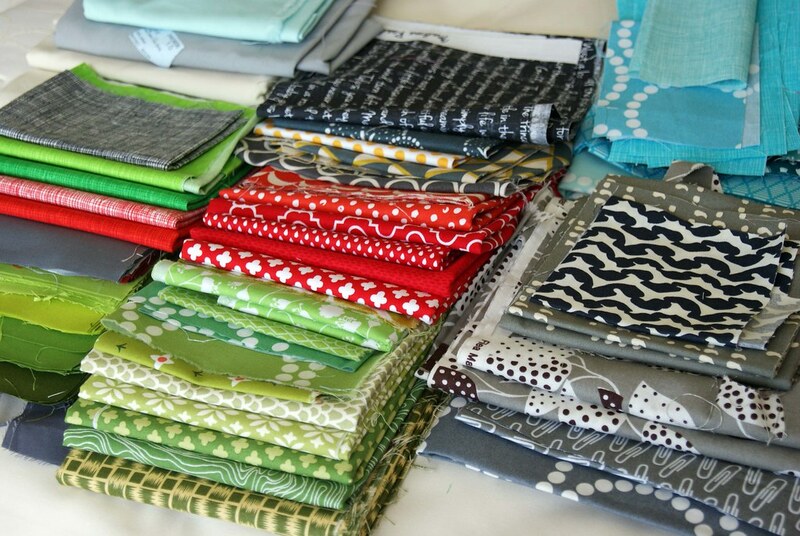 So help me with my fabric selection for my Christmas Penny Sampler quilt. Please? And to motivate your responses, how about that pay it forward giveaway? 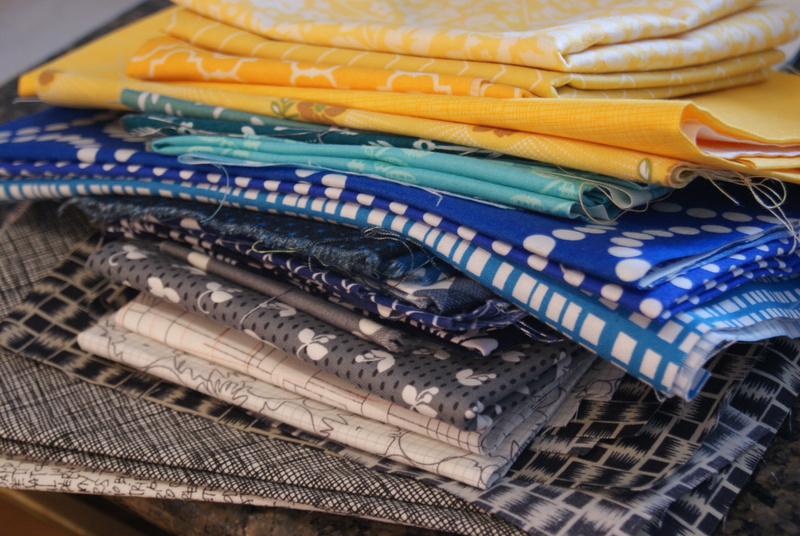 In honor of Hydee, these are 9 fat quarters of fabrics from my stash, which needs serious thinning if it is to continue to fit in one bin (and fit in one bin it must). They’d make an awesome pillow–I’m currently obsessed with Cari’s Palatina Pillow–or they might be a start to your own Roy G. Zig quilt. So, comment below. ETA: I’ll close comments on Friday, August 2. 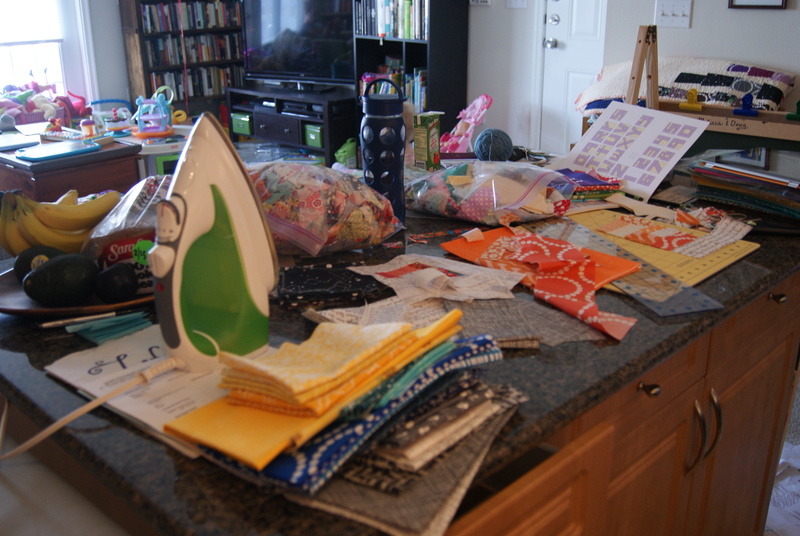 Help me with my Christmas quilt fabric selections (and Kona suggestions, please! 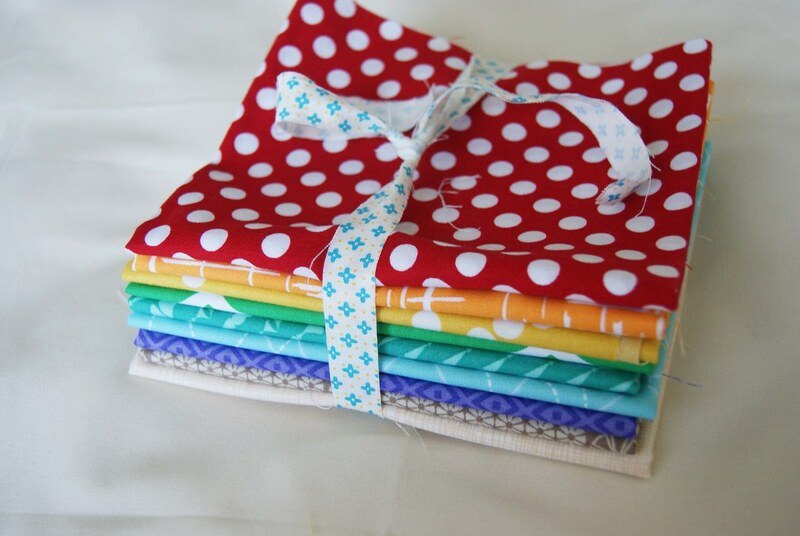 ), and maybe win a little rainbow stack of fabrics for right now!